Lynn Warren – I wrap asparagus in phyllo dough that’s been brushed with melted butter and parmasean cheese, you wrap the asparagus with it and bake. very easy, and can be eaten at room temp, etc. Sounds ridiculously excellent & easy. If you’re a fan of asparagus, you may enjoy it steamed, grilled, roasted, or even nuked. I love the stuff if it’s prepared well. This sounds like it would go over quite well. Parmesan cheese is always a win. Maybe some Romano… and I may add garlic. If we wanted to get really nuts, we could wrap ’em in bacon & and the dough. Found a recipe from Paula Deen that says to bake at 375° for 15-18 minutes. Google for ideas! I did an article a while ago on my other blog called More than 6 ways to cook a hot dog. It’s a nice general guide to several ways of cooking an old standard. A while ago, I blogged about stumbling on to an article listing 6 ways too cook a hot dog. We all know there’s more. Here’s a much better list. OK, maybe not better… but bigger. Thanks to everyone for their suggestions submissions here and on Facebook, I hope to include them all here. Grill ‘em. The general consensus seems to be that if you’re going to cook a hot dog, it needs to be grilled. I would agree with this. I usually don’t break out hot dogs unless I’m already grilling burgers. They’re there for those weird non-burger people, or a topping for your burger. Charcoal Grill – This is old school grilling, get it hot let the flames & coals cook the dog with some nice grill lines or looking like the victim of a flame-thrower accident. There are good instructions on grilling w/ gas & charcoal here (as if you need them). Propane Grill – It’s a little easier to control the heat, & you’re less likely to produce the same flame-thrower victim effect if you keep an eye on ‘em. There are also good instructions on grilling w/ gas & charcoal here (again, as if you need them). Foreman Grill – Or any of the imitators & whatever they’re called. I’ve seen a Hamilton Beach one, I’ve seen them called electric grills, counter-top grills, whatever… you know what I’m talking about. I’ve had little success with the Foreman Grill & hot dogs… which is odd, because it cooks other stuff quite easily. Here’s a video on how to cook ‘em on the Foreman Grill, …because I can’t find good text for it anywhere. They don’t list a time for hot dogs in the book that comes with it. Maybe they assume their grill is for convenience, and it’s more convenient to nuke or boil your dogs. If anyone has $99 to spare, I’ll take the USB iGrill from Think Geek. Infrared Grill – I know nothing about this newfangled contraption. It looks like you can burn a hot dog in 0.5 seconds on one. Learn about infrared grills at Wikipedia. Griddle/Flattop Grill – If you have one in your house, you are awesome. You can certainly cook a hot dog on one, and don’t need me to tell you how. Open Flame. Who doesn’t love hot dogs (or anything really) cooked over a campfire? …Or a bonfire, trash barrel fire, or while the neighbor’s house is burning down? With these methods, You can also wrap the dog with biscuit or croissant dough from those creepy popping tubes, and it will cook nicely over an open flame. If you want to get really crazy, slice it down the middle & stuff cheese in it, or wrap some cheese around it before the dough. Skewer – We use roasting forks or or just sticks. You can get the forks at any sporting goods or camping store, in a store that has a camping section, or in a store near your camping site. You can get sticks in the woods, or from a lone, sad tree. You can also get inventive, like this guy. Be careful choosing sticks and being inventive… you don’t want anything that will poison your hot dog… like toxic wood, metal treated or painted with anything, and of course plastic. I can’t seem to find a guide online of safe & unsafe tree branches to use when cooking over a fire. Anyone have a boy scout handbook? (I asked Yahoo!, apparently nothing out there will kill you, but stick with a non-sappy wood.) With this method, get your fire going, and hold the hot dog over it… but not in the flame unless you like black crispy possibly carcinogen-laced hot dogs. If using a store-bought fork, it’s up to you if you want to put the dog on long-ways, or double/triple ‘em up the forks. Pie Iron – If you’ve camped with me, you’ve cooked with a pie iron… or you’ve watched me cook with one. My favorites include pizza ones, and Reubens… but I’m sure you could stuff a hot dog into one. They also have ones that are shaped to cook hot dogs. This would most likely result in a nicely cooked dog without the singe marks, maybe flavored with some onions (gross!) or sauerkraut. If you’re buying a pie iron, buy one made of… iron. This sounds dumb, but they make aluminum ones, and I have melted them with no problem. I don’t think you want aluminum flavored hot dogs. The Cage – Burger basket, grill basket, vegetable basket – all different names for a similar utensil. 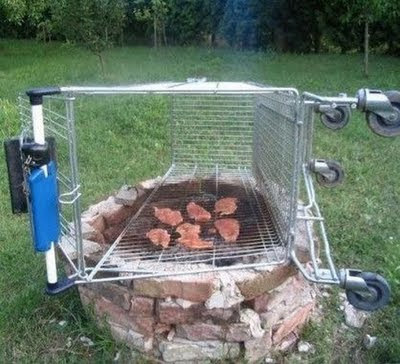 I’d use it like I would a fork for hot-dog cooking… may be sort of useless unless you have a burger in it too. The Rack – If you can find some sort of rack or grate that you can secure safely over the fire that’s also safe to cook on, you can cook like it’s a charcoal grill if you’re more comfortable with that. Just make sure the flame isn’t eating your hot dog before you do. Foil Pack – You could use the bread dough & any toppings/sides here as well. Wrap the dog & even the bun in foil, and place it on a grate over the flames, or in the coals around the bottom of the fire like you would with a baked potato. Oven Burner – That’s right. Pit it on a fork or roasting fork, and hold it over the flame on your stove top. This might not be safe, but I bet it would be fun. Boiled – I’m sure you’ve all had ‘em like this. I think it even suggests to heat ‘em this way on the pack. I’m not a fan of boiling anything any more, unless it’s soup or pasta. It just seems like a lot of flavor goes into the water… and where hot dogs are concerned, it’s not like you have a lot to work with to begin with. I’d suggest boiling hot dogs in beer, even though I’ve never tried it… it sounds pretty awesome. You can even get crazy with beer, ketchup, and brown sugar. Maybe some beef broth or bullion would be cool here too… but that may make ‘em to salty? I dunno. Boil at your own risk. Nuke ‘em – I guess that besides grilling, this would seem to be the most obvious method of cooking hot dogs. On the last pack we bought, this method was featured larger than the other methods. Just 30 – 40 seconds in the microwave … wrapped in a paper towel? I never use the paper towel. Is that to hold in moisture, prevent explosions, or what? Apparetly there’s an art to this, because I have found the articles How to Cook a Hot Dog in a Microwave and the possible passive-aggressive How to Cook a Hot Dog in the Microwave Without Exploding the Ends. As I write this, I have an urge to make some hot dogs explode in the microwave. I may be developing a disorder. Lovin’ from the Oven – You can certainly cook hot dogs in the oven, you may split ‘em open or poke them with a fork first. This method would be ideal for the croissant-wrapped hot dogs, smothered in some awesome cheese. Just make sure if you use the 1st linked method, that you put the foil in the oven before you heat it up (like they so diligently mentioned)… or don’t do that, burn yourself, and stay off of the internet. Deep Fried – They call these Rippers in New Jersey, no? I don’t have a fryer… but I suppose I could do this in a pot on the stove, or in my turkey fryer. I’ve never had one, but I’d imagine it’s a pretty good thing. Corn dogs could be lumped in here too, I guess. Steamed – This seems to be a popular method, but I know I’ve never done it, or really seen it done. I guess there are commercial steam cabinets for hot dogs… but I bet you could steam it like you do with vegetables if you have a steamer. Perhaps, like boiling… you could steam it with beer…? In the Skillet. – Or frying pan. Just fry it on the stove top with a little bit of oil. I guess you could slice it open first if you wanted to, so it doesn’t pop on you. Or, you can elevate it to an art form. Crock Pot – Pop ‘em in the crock pot with some sauerkraut (maybe along with some beer), and you’re good to go. Car Engine – Why not? In Stuff – Okay this isn’t one specific method, but I didn’t feel like all of these should have their own #’s on the list. You know you’ve chopped ‘em up and added them to baked beans, mac n’ cheese, or even done a hot dog & potato bake. Here I’ll also inject that I once got the SpaghettiOs with hot dogs. They were inexplicably gross. This is your final warning. The Hot Dog Toaster – Besides looking creepy, these also apparently cook hot dogs. It looks to be just a toaster with hot dog-shaped holes and bun-shaped holes. I wonder if it really cooks the thing through very well? May be quite convenient. Solar Hot Dog Cooker – This might be fun for campers or science geeks. Solar ovens are pretty awesome, this one and this one are especially geared for hot dogs… this one might work. The Roller – These apparently come in several varieties, but all look to be the same concept… Cooked on rollers like the ones you see at the convenience stores. Brookstone makes one, there are a bunch of professional ones, and Nostalgia Electrics offers the Roller & “Ferris Wheel” varieties. The “Roast My Weenie” guy – More of an accessory, this really just needs to be seen. Electrocute it – My cousin told me a tale via Facebook of a hot dog cooker for electric chair, taser, and Tesla enthusiasts… called the Presto Hot Dogger. Mad scientists can try it at home with a few things from around the house. This actually looks pretty awesome. This vintage one looks like a torture device. Well, those are all the methods I can think of right now. Well, other than going to Sheetz or Dormont Dogs… you should be able to get your hot dog fix by one of the methods described here. If you have another technique, please list it in the comments below! If you need more info… check out the list of hot dog variations. Also up for discussion… now that you know how to cook one, what do you want on your hot dog? Yeah. How I make stuff in the kitchen. Cookpendium. Welcome to my online recipe box. I hope you find something you like! Please, feel free to add your way or suggestions in the comments!